Notes from the frugal kitchen, which is noticeably messier after 2 weeks of hard use. Thanks to Jen at Conversion Diary's 7 Quick Takes for the invitation! One cucumber vine provides all the free material you need for vegetable peeling lessons. We may be carving swans by September. Mint is another cheap yet prolific plant. Kids can't outpick it. Ever since I tasted Shauna's fruit salad, I've diced a few mint leaves into my own. Just a little grace note. And look! More cucumbers! Soup recipe from Mollie Katzen's Salad People, chilled punch cups from Goodwill. Dining out can be stressful with kids plus guests, who may not be used to spills at every meal. We all relaxed after vowing to eat at home. Our best outing, hands down? The fantastic FREE production of Cinderella at the Nashville library's marionette theatre. We may go see it again! led us to deeper conversation and kept the kids at table without as much fidgeting. When we realized that Sunday brunch might not work, I picked up a pound of smoked salmon salad from Fresh Market ($7) to serve at home. 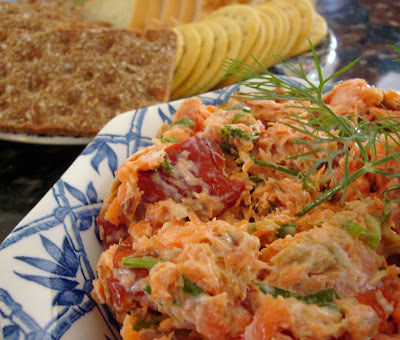 Excellent budget compromise and so easy with crackers, fresh salad, cheese and fruit. Potted plants make quick, cheap centerpieces. I splurged on hanging baskets from Home Depot's $3.33 sale, rotating two between front steps and table. Great ideas, just lovely! Thank you for inspiring so many of us. I hope things settle down a little soon. I don't know what to say other than I love everything you do! You are a huge inspiration to me to live simply and beautifully. Your kitchen looks mighty clean to me. Your house looks so airy and cheerful. Something funny...the color yellow makes me very nervous! When we were first married, we could only afford 1 can of paint. And my husband chose yellow! EVERYTHING was painted yellow! The bedroom, livingroom, kitchen, pantry. To this day, I can barely tolerate the color. I have learned, however, to appreciate it in OTHER people's homes. Have a great day. I am glad you are back. I missed you. You're such an inspiration to so many. Can I just say that I'd love to be a houseguest of yours? I'm just amazed at how you make everything look so lovely! Wonderfully inspiring ideas! Thanks for sharing! 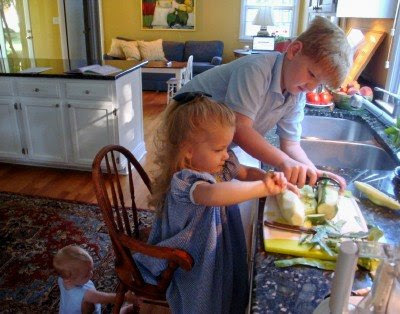 Love the picture of your little ones peeling cucumbers! Very lovely pictures. I'm glad to see that budget compromise is sometimes an option. Keeping enough food prepared and the kitchen clean seems to be neverending when all my family is visiting, and sometimes we do choose to eat out. You really must be a fan of Alexandra Stoddard. "Grace notes" is a term I remember from perusing her lovely books. Great tips! Sometimes we do have to compromise to make life work and to me that is what being frugal is all about. Great "slices of life." I will have to keep an eyes for that Table Topics game. Love your ideas. The salmon salad looks wonderful. Beautiful plant too. You're so right about eating out with guests who aren't accustomed to eating out with littles. Sometimes the frugal choice makes sense in so many ways. I love the "quick takes" from your busy, busy couple of weeks! Everything looks lovely! Wonderful ideas. You inspire us all with your inventive displays. Thank you so much. Beautiful table! 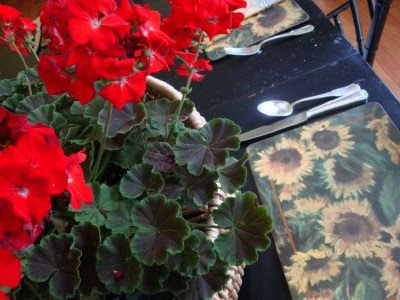 I use to have sunflower placemats just like that! thanks for visiting my blog! it's nice to meet you! it looks like the kids are having fun peeling the cucumbers. i'm sure that kept them busy for hours! Love your 7 Quick Takes! I have a crazy amount of cucumbers too. Your blog is always so visually appealing to read. Thanks for bringing such beauty to the blogosphere! 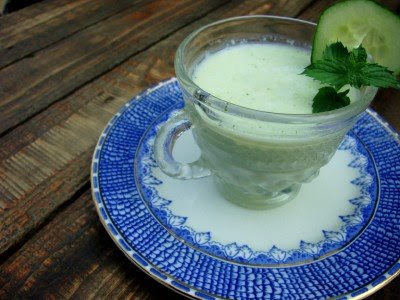 Here's a recipe for honeydew soup. Your cucmber soup reminded me of it. I love cold soups! Thanks for all the creative ideas I get from reading you blog! I just love the child's chair that Elise is kneeling on. Was the chair a great find at a rummage sale or is it a family heirloom? It is beautiful. I have a Stokke chair for my son, which will grow with him and which I use ALL the time, but I have always wanted a chair like yours. They are really precious. Thanks Aimee. That's a $1 junk store find. It's originally a Jenny Lind high chair, only without the tray. It's not valuable but I too like the heirloom look. What beautiful photos! 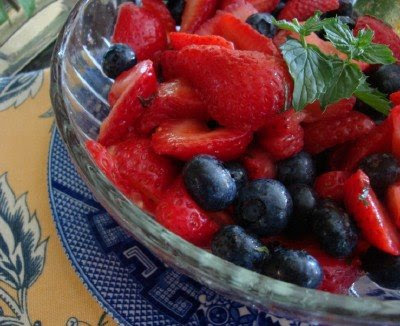 Mint in a fruit salad sounds so delicious - a special cool summery treat. I've been reading and loving your archives since you've been away. I'm seeing my Goodwill with fresh eyes and realizing that my husband really appreciates coming home to those little touches after a very long, very stressful day. Well done Meredith...Keep it up! After you commented on my 7-quick takes post, I had to take a look at your blog. It is beautiful and SO inspiring! Sadly, there are no thrift shops here, but we certainly make do with what we have. I also really appreciate your willingness to to let your kids get messy. I need to be more relaxed about that, to be sure! Can't outpick it -- very pretty phrase. You have the gift of hospitality times 100! I know your guests must have felt very special and very spoiled. I am always amazed at what you pull off...I'm inspired every time! Is the baby standing already? And here I am seriously jealous of all those cucumbers because our cucumber vine is just not doing well. I think we'll be lucky to get 2 or 3 from it. I so miss you blogging, but completely understand your need for your family to be your focus right now. I check in ofter for "food for thought" and always enjoy the links.